Home » squirrel spinners » What exactly do you mean by "squirrel spinner"? What exactly do you mean by "squirrel spinner"? Now honestly... I have read literally hundreds of squirrel spinner reviews all over the Internet while running this website for the past 3 years. All kinds of reviews, both positive and negative of course. And what I have learned from negative reviews is that people have no clue how to choose the spinner with the effect they expect to achieve. This short advice here on this page is to help you avoid waste of money, improve shopping experience and prevent disappointment from possible wrong spinner choice. So what do you expect from "squirrel spinner"? The problem is that the term "squirrel spinner" is broad in meaning and often used to describe at least two types of squirrel spinners that are of completely opposite purposes. One is to feed the squirrels, the other one is to chase them away! I suppose you are already getting picture where people usually go wrong when making spinner choice. 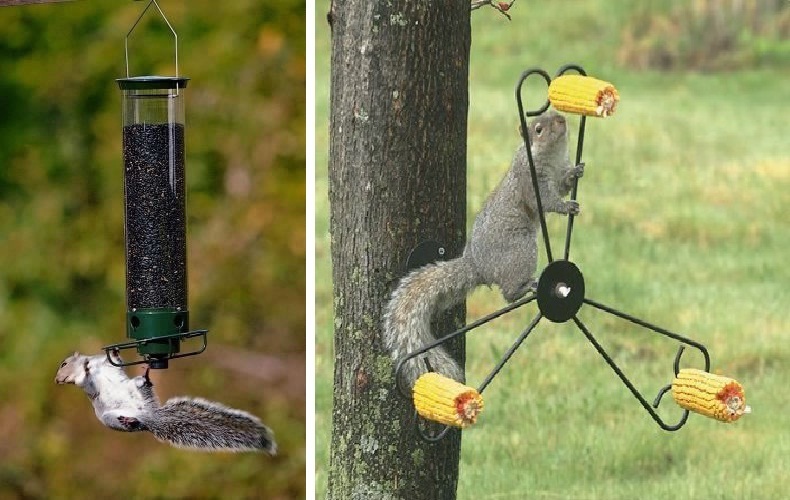 Spinner to the left on the photo aims to spin-off squirrel from bird feeder and prevent squirrels from eating bird food. If that is what you expect, please check the best spinning anti squirrel bird feeder there is! In case you want to forget about the birds and have fun watching squirrels spinning on squirrel feeder, please check best reviewed spinning squirrel feeders. The collection is small, but it's hand picked.